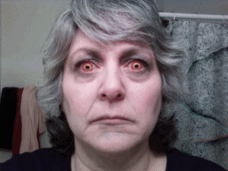 Halloween contact lenses | Contact lenses are a great addition to any scare! Halloween contact lenses are the perfect finishing touch to complete the outfit you have chosen for that big party! Used in movies and theatre productions for special effects, crazy contact lenses can change how you look in seconds. Wear them out for a night on the town, or wear them to match your mood – the choice is yours! The use of crazy contacts surges at Halloween, as this is the biggest costume party of the year. So make sure you get yours and complete that outfit with some stunning or frightening eyes. Want to go as a cat? A devil? An alien? A vampire? Whatever costume you are wearing, there are special effect contact lenses to match – only your imagination can stop you. Your friends will be jealous as they see all the attention you get, and will want some Halloween contact lenses of their own! Make sure not to share lenses or let anyone try your lenses on, as this can pass bacteria between your eyes and could cause an infection. You should consult an eye doctor before making a purchase of crazy lenses, just to check your eyes and that they are ok to wear lenses, even if you don’t need a corrective prescription. Also remember when putting your crazy lenses in or removing them at the end of the night, to wash your hands with soap and warm water before touching your eyes. Clean and store your lenses in approved solution, and never use non-sterile solution or water. Don’t put your lenses in your mouth as saliva is not sterile. When putting your lenses in their storage container, always use fresh solution. If wearing make up with your crazy lenses, put your lenses in your eyes before applying make up, keep your eye shut while applying, and brush away excess powder before opening your eye. Don’t use eye liner between your eye lashes and eye. Never share eye make up, as this can pass bacteria between people and you risk an infection. When removing make up at the end of the evening, take out your lenses first, and then take off your make up to prevent any make up or remover solution getting in your eyes. Special effect contact lenses may be a fun and novelty item, but they still require as much care and hygiene as regular contact lenses. If you have any concerns or questions about wearing crazy contact lenses, consult your eye doctor.